The wedding illustrations you created for us have been admired by everyone who’s seen them, and we have received requests for copies, but feel very possessive! The collection encapsulates the colour and vibrance of the day as I remember it, while presenting some wonderful exchanges and vignettes that I would, otherwise, be unaware of. What fabulous eavesdropping techniques you command! Your talents are extraordinary, Sarah, and so is your humorous, punctilious attention to detail. Those illustrations are more alive than any photo, and we just love them. Thank you again, so much, for creating these treasures. They are irreplaceable. We have the pictures! They are just wonderful, thank you. When we initially saw your website we thought the pictures looked lovely but when we saw the drawings of our day, with all the lovely and perfectly picked-out text, they were so, so special! 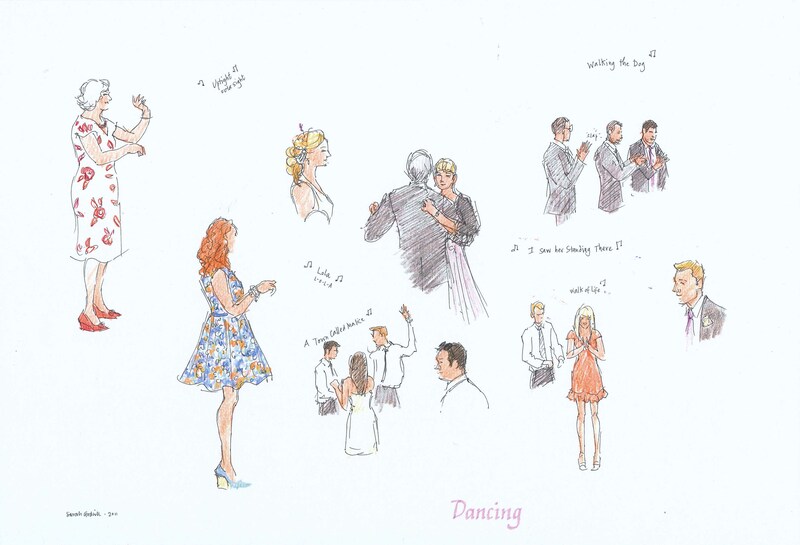 We can pick out every one of our guests you’ve drawn so beautifully, and can even tell which precise moments you’ve captured…down to Gareth’s cousin Nick and his girlfriend jiving and the ushers doing the “clap, turn” dance move, as I’m reliably informed it’s been christened! It’s such a special and unique memento of the day, and we will absolutely treasure the pictures forever. Thank you. Personally, I shall be showing them to all my friends who are getting married in the future…I can’t see why anyone would get married without you there to draw the day! Thank you for all the painstaking and inspired work. We were too busy and concerned about our guests to enjoy the wedding properly. We are now enjoying it in hindsight through beautiful mementoes such as yours. A HUGE thank you for the beautiful drawings. They were so wonderful and we are so very thrilled. The drawings really did capture the day and we can’t express how much we love them. It brought the wedding back to us as we had forgotten so much. …Jamie and I were enchanted with the drawings and the detail – we recognised everybody and you allowed us to see things we hadn’t noticed on the day. We loved having you as our guest and our guests loved meeting you as well! We’d like to thank you for such a wonderful, wonderful, wonderful wedding gift. You have really captured our day and we are delighted, it feels such a treasure. We were very overcome when we received it, the words you have noted brought the entire day back – the joy on our faces and everyone else’s, is really marvellous. I really pity anyone who doesn’t have an artist at their wedding. Your talents are unsurpassable. Thank you for our wonderful sketches. We were delighted to receive them and feel that you have really captured the flavour of the day. We were also delighted that you stayed for the evening. It helped complete the day’s events, especially as we did not have a video in the evening. Thank you for your enthusiasm. You have a real gift and it has been an honour to be present when you were sketching. 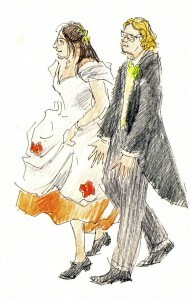 We greatly value your wedding sketches; they will be a wonderful and unique inheritance. WOW !!! What can we say except thank you so very, very much for all your hard work and talent that went into producing our superbly brilliant wedding drawings ? We couldn’t believe them when we saw them. You have picked up every tiny detail and captured such perfect likenesses that there is no one that you have drawn that we didn’t immediately recognise. We are so over the moon with them that we cannot thank you enough. What can we say but thank you ? We received your drawings this morning and we are absolutely delighted…not only are they beautiful, they also capture the mood with wonderful accuracy. Thank you for working so hard as we enjoyed ourselves, and for joining the celebrations. Having the drawings is so special for us…you are truly gifted. We are so glad to have had you record the day. The next day an amazing illustration of Anna and me arrived in my in-box and I was totally blown away. The sketches of all the people at the tweet up were instantly recognisable even though I had only met most of these people once. 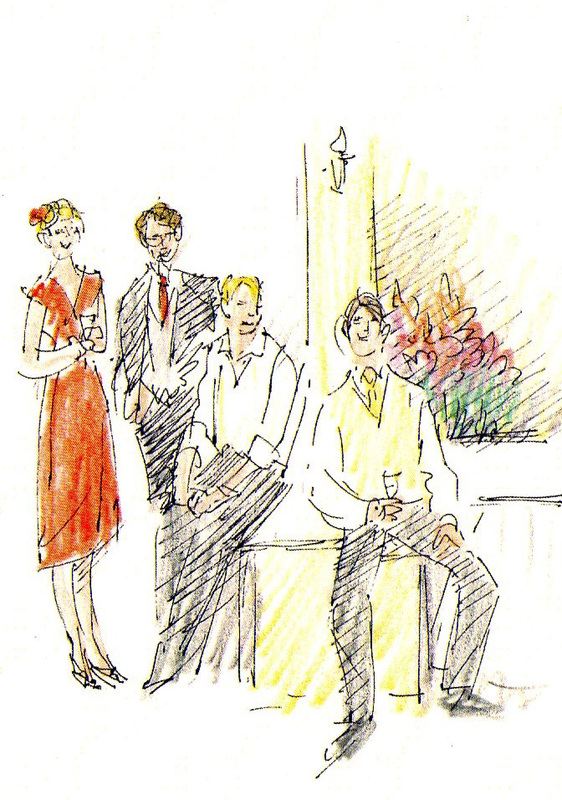 Her work has this great Quentin Blake feel to it and looking at the further illustrations of the events and weddings she had drawn, I just keep thinking ‘Four Weddings’ (one of my favourite British films, all eccentric and dappy instead of miserable and grey!). Its beautifully English Summertime feel really makes the drawings and people come alive on the page with her vibrant use of colour and ability to capture personalities. 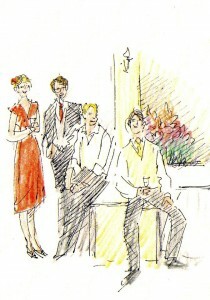 I can just imagine how amazing it must be to receive a portfolio of the sketches after your wedding or event. It’s an illustrated story book of your day and one of the most gorgeous ideas and talents I have seen in a while. Not to mention she’s a really lovely lady too who you would really want at your day. Scrap the silly chair covers, favours, tea cups and even pudding, this is way more of a lasting treat. Would you fancy getting your wedding drawn? 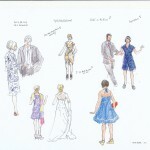 Check out @iDrawAtWeddings, like them pictures from court but no one looks guilty! 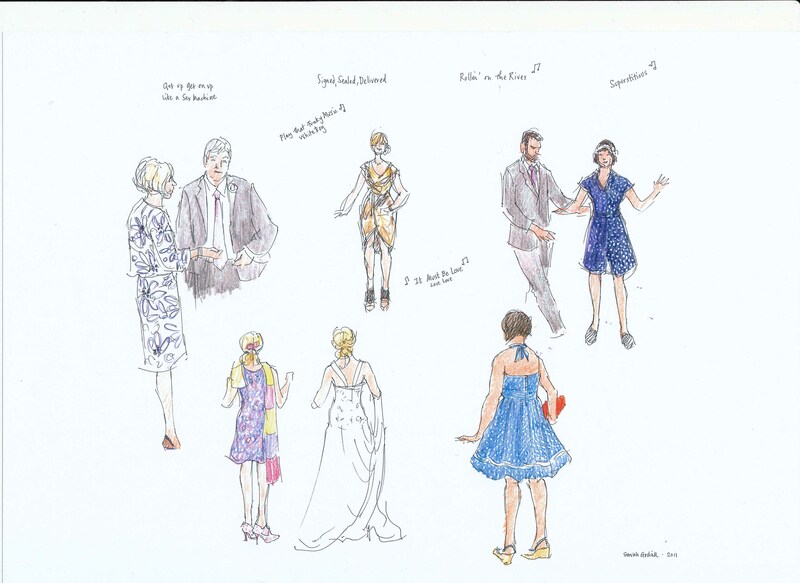 Having an artist in residence at your wedding – what a fab idea!